Recently, I’ve received many messages asking: How can I help migrants and immigrants at the U.S.-Mexico border? 1. Call your legislators—your representatives in Congress, your Senators and the White House—and express your opinions. You can find their contact info easily here. Also, in the next election remember that these issues matter. 2. Inform yourself with facts, not uninformed opinions and baseless rumors. The misinformation about migrants and refugees is often driven by racism and fear. Listen to the stories of migrants and refugees, and encounter them as individuals. How can I inform myself? Catholic Legal Immigration Network (CLINIC). Legal help is very important right now particularly for asylum seekers. 4. Advocate for migrants with friends, family and publicly. They need advocates. The voiceless need your voices. You can also read and sign the Advocacy Action Alert on Family Separation. Finally, this Thursday, June 21, at 3:30 PM ET Ignatian Solidarity Network will host a live video conversation on family separation with Joanna Williams from the Kino Border Initiative, Dylan Corbett at Hope Border Institute in El Paso (this organization was started in partnership with Bishop Seitz and the diocese there), and Ashley Feasley from U.S.C.C.B.’s Office of Migration and Refugee Service. It will be broadcast live via Facebook Live at: https://www.facebook.com/IgnatianSolidarity/ and available via recording afterward. Well said, Father. Thank you for the call to faith and courage. Maybe we should also be discussing an immigration policy in stead of emotional appeals. There are over 600 million in Latin America. How many of them would come here if there were no controls. Who should get preference out of this 600 million? How about the rest of the world? Are the people encouraging the migration to blame for the problems? I doubt any America editor or author will answer these questions? and what is the median number of children per family? High birth rate corrrelates with poverty, and any family admitted to the USA would be an immediate burden on welfare and social services. I am all for keeping families together, but short term emotional appeals by Martin and others fail to take serious responsibility for the long-term needs of these families. How about we practice a humanitarian immigration policy where we admit everybody for 2 years for free health checks and free education--then give them free transportation back to the country of their choice? If they want to pursue legal entry later, then they can do that via INS policies. Otherwise, the emotionalism of Martin and others only makes the situation worse. I have yet to read any criticism of the Catholic Church preaching unlimited reproduction in Latino countries. You reap what you sow. If Latin America is an illustration of Catholic Social Teaching then we should be wary of it or any other Catholic political positions. Catholic moral teaching together with free market capitalism imbedded in English land ownership policies has changed the world for the better. It is time for this to be preached anywhere in the world it is not practiced. As far as I can tell, most of the "Catholic" countries you denigrate have private ownership, free market capitalism and, I guess, Catholic moral teaching. They also have a powerful country, some would say empire to the north that manipulates their politics and invades as needed to "keep the peace" for its own economic interests. To a great extent, especially in Central America, the present condition of those countries was shaped by the USA. Our fingerprints are all over the place. Not even close. Try starting a new business in these countries and who owns the title to land? I think you should read more. Try exploring with Hernando de Soto, not the explorer and Niall Ferguson. Catholic countries/Social Teaching have a notoriously bad record of helping the poor. Violence and poverty are common. Why? These countries are characterized by large gaps between rich and poor or are they not? We are headed in the same direction. Once our safety nets are gone and workers' rights are annihilated, we will be Nicaragua et al. The move of the Church in South and Central America toward social justice is a more recent phenomena. Before that, they were allied with the ruling classes for centuries. But the ruling classes still rule. Using the Church's social justice teaching as an explanatory device in Latin America is fallacious. It played no part in the formation of those countries. If anything makes a country more stable, it's the presence of a large middle class. You are part way there. Nothing the Church has ever been involved in economically or politically has worked and social justice sounds nice but it will not work any better. It will make things worse. They should stay out of both areas and focus on saving souls. They are good at that but have lost their soul in trying to make life on earth into heaven. All it does is create a hell. Encourage their members to be good Christians through individual action. That will change the world not their meddling in politics and economics. There are good economic and political structures but the Church has never recommended them and actually thwarts them by their recommendations. The failures by the Church in this area throughout history and today have been catastrophic and is why they should stay out of politics unless they see true injustice. Why have American Catholics done so well? Church moral teaching and an economic and political system that the Church never endorsed and still do not endorse. The totally otherworldly Church you speak of is exactly the Church that supported the societies you malign as inferior. Take it up the kazoo from your betters because it's only the unseen afterlife that counts. If the Church's social justice theory had any effect, it was in the formerly Catholic countries of Europe when they were Catholic. I'd say France isn't doing too badly. Catholic Bavaria is a prosperous region of Germany. Belgium, the Netherlands. Italy is not Nicaragua. Latin America was taken by conquest by a small white ruling class. The United States was conquered by a large influx of whites who stole the land from the Indians in a more distributed way, making for less of a wealth gap. You are taking formerly Catholic areas to show how well Catholic Social Teaching is working. That is an interesting argument. They adopted the English model in the mid 19th century but especially after WWII. The Protestant Dutch and Flemish did it much earlier. That is what lead to prosperity. Catholic Social Teaching has been around since the 1800's. Again I suggest you and others read more. Jonah Goldberg, Niall Ferguson and Hernando de Soto are good starts. And everybody should read Thomas Sowell. But be careful if you like progressive ideas. He exposes the flaws, futility and hypocrisy of progressive thought. And by all means read Deidre McCloskey to explain why the common person rose in England, Holland and the US. You continue to ignore that English prosperity was based on empire, conquest and exploitation, which works very well. Holland, Belgium, and others also participated in this activity. Economic competition and dominance is also backed up by military power. If the Spanish fleet hadn't been defeated by the forces of nature, where would be the respective positions of Spain and Britain in the 19th century. Britain maintained its empire longer than Spain and was much more economically prosperous. And which country has the greatest growth today. China. Should we adopt their model? Maybe we are? We have a president who values autocracy and to a lot of americans, this is no problem. Again, I suggest you read and see if you still hold these opinions. Spain thrived long after the Armada but did not represent a threat to England anymore. That is correct. But their economy with their colonies eventually withered away because it was based on silver and gold and less on over all commerce. From 1750 England is one invention/innovation after the other by common people. As an aside, our Dutch tour guide said that Charles V told the Netherlands they couldn't use their fleet for trading. So they became Protestants and had successful trade. The key is freedom. It is what the Church is missing in its social teaching. Catholic Social Teaching is just the opposite of freedom. Slavery is the opposite of freedom. It worked quite well for everyone in the system but the slaves. When you can't own people outright, you dominate them economically and legally. Wage slaves will do quite well. Over the last 38 years, unprecedented concentrations of wealth have gained governmental advantage. This eventually results in an establishment that cannot be challenged except through violence. The system is rigged. And a feeling of helplessness rises in the citizenry. I assume you agree with me because you state no objection. If you have a question, I will gladly answer it. By the way Trump/Session's policy is the law they inherited and what Obama, both Bill and Hillary Clinton and Diane Feinstein have recommended. There is hypocrisy someplace. Don't you agree? This all about votes in an election, not about children or their well being. The outrage is phony. Catholic Social Teaching is antithetical to how God made us. Free Market Capitalism is the only economic system that is congruent with human nature. The supply/demand curve is a basic of the natural law. Free Market Capitalism is essentially supply/demand in action. Inflammatory, insulting language alienating our neighbors does not help. If the US has any influence , aid, investments, business development that has a possibility to change the violent, lawlessness people are fleeing. But other countries will need to join with us. BTW it's Sr Norma Pimentel. Why are the Bishops not going as a group to Capital Hill to denounce the separation of children at the border and demand Congress pass a single issue bill to stop this policy. This action would be inspiring to the nation. Otherwise, the Catholic hierarchy looks impotent as well as all talk and no action. Faith without good works is dead. Really, what are we saying here? Open borders? 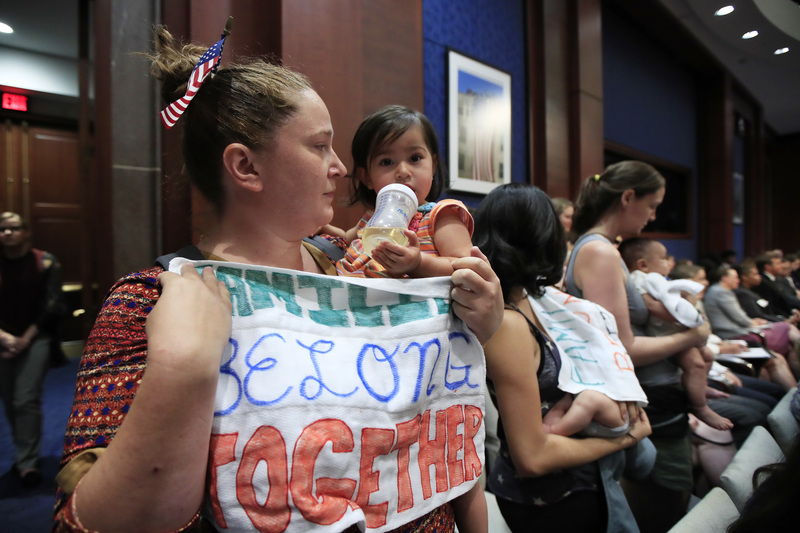 Family facilities to detain those entering illegally? Just round everyone up and send them back so there is no family separation? Or are we saying whine to legislators so as to feel oh-so-good. Does Fr. Martin have any realistic solutions at all? Our church is becoming more of a whiney PAC every day. They stamp their collective feet and complain and this certainly is neither faith nor courage but IS an attempt to view the world from overly simplistic yet lofty moral heights. It's probably better to be a sinner than a saint because my sins allow me to be more realistic about the world in which I live and, hopefully, to entertain realistic solutions. I'm glad I'm neither scribe nor Pharisee. "Whine" to legislators? No. Last I heard, they work for me. Although, yes, in the real world, they only work for the rich and corporations. But I can still phone the rectal apertures. If an American is arrested committing a criminal act and detained, do his/her children accompany the prisoner to prison? No but not the same thing. Mostly male accused. Child is in hands of other parent or nearby family or placed in foster care. This is not good, either, and compounds the negative effects of poverty. Oh, one more thing. Crossing the border illegally us a misdemeanor, not a felony (unless repeated). Those being jailed have the opportunity to place their children with a relative, usually the other parent or a grandparent, aunt or uncle. Child welfare laws require that social workers first explore all relative options before considering stranger foster care. Research shows that children fare far better with relatives than with strangers for a variety of reasons: less likely to be moved around, access to many role models, familiarity with community, low likelihood of abuse, greater likelihood of access to educational services. This holds true even when families are very poor. I am an Emerita professor of Social Work. This is my area of interest, so I am glad you asked! Anybody hear any or even one of Father Martin's suggestions from a pulpit or church bulletin at Sunday Mass in a USA Catholic Church the past two weekends? Your answer tells you something, doesn't it! I expect you would want them to condemn the Democratic Party because Obama, both Clintons and Diane Feinstein (chairwoman of judicial committee) are on record seconding what Sessions is doing. Obama kept them in cages wrapped in aluminum foil. If indeed that is true, guess what, they were immoral too! I have a feeling, however, that the circumstances that they created in no way matched what Trump, Sessions, and his silent Republican legislators accomplished for 2+ weeks. Two nights ago I listened to Mercedes Schlapp, a White House sycophant, wife of Matt Schlapp, head of the American Conservative Union and braggart on TV programs of his Catholic religiosity, defend the separation of children from parents. As I wrote on a NY Times comment this morning: “Just look at all the white women who came forward to speak heartily and approvingly of Trump’s separation of children from parents. What kind of a culture produces such insensitivity, such women?” May I add, what kind of religion produces such women? Not the one I believe in! Children are separated from their parents in large numbers in the United States and in larger numbers all over the world every day without a peep. All the photos of Obama's cages are not to be seen in the press. This is another fake news narrative and virtue signaling. No one cares about the children or else they would be questioning why they are there. The outrage is phony, it is about votes in an election. Our social responsibility collaboration is sponsoring an event this Thursday in front of the local ICE office to show our support for families at the border. Many of us have been to Latin America and believe that both U.S. foreign policy and corporate globalization drive the numbers of poor people seeking a new life in the U.S.
Ok. What do you think should be done? "How can I inform myself?" Looking forward to seeing a full expose of Obama's actions. "How can I inform myself?" What would Jesus do? If you think that is a rhetorical question, then you should rethink your association with a Christian church. Lots of anger here, lots of blame, lots of living in the past. Doesn't matter what the previous 44 President's did or didn't do. It's what is happening now that counts. What would Jesus do? Hmmm, why not pray that parents avoid attempting to enter the US illegally while accompanied by their children? Is that a bad idea? Eighty percent of the children entering the US from Mexico are unaccompanied. The best thing you can do is go to usa.gov and sign up to become a legal foster parent. The church could easily do that as well with their priests, brothers and sisters - they should all become foster parents to these kids. The politicians certainly aren't going to do it. Immigrants and refugees - they are all special ambassadors of the Good News. See all work by James Martin, S.J. More by James Martin, S.J.